Wild seeds can be sown and raised as individual plants in seed trays and pots in the same way as any other garden plant. This approach requires more effort than sowing in the open, but as the proportion of seeds that result in an established plant is higher this method can be particularly useful for difficult or slower growing species. When sowing under cover in a cold frame or greenhouse, seed can be sown at most times of year to produce plants for autumn or spring planting. Quick growing annuals and perennials will be large enough to plant out in 4 - 8 weeks from sowing, slower perennials 3 -12 months. Wild seeds grow well sown on most standard horticultural composts (including peat-free compost). Sow thinly and cover to a depth no greater than the width of the seed sown (ie for the finest seeds no covering at all). For seeds which will be slow to germinate (eg cowslip) a thin layer of horticultural grit scattered on the surface will help prevent moss and algal growth. Keep the compost damp, but do not over-water. Over-wintered trays are best kept covered (eg in a cold frame) so that the compost does not get saturated by winter rains. Seeds will germinate naturally when the temperature and light conditions are suitable. Gentle heat may be used to bring on plants early in the year. Plants raised under cover or out of season, however, will need careful hardening off before planting out. Once growth has started keep the seedlings well ventilated to help prevent mildew. Wild seeds are generally more reluctant to germinate than seeds of most cultivated plants which have been bred for ease of cultivation. Most wild flower seeds possess some degree of dormancy which means that germination will be delayed until the appropriate conditions are met, and some also require a particular environmental trigger before germination can occur. For many species these conditions are easily and quickly met so that some germination occurs after only a brief delay. A few species eg cowslip seed will only germinate after the sown seed has passed through a winter - in this case the seed must be sown in the autumn several months before germination takes place. More detail on germination and dormancy can be found in individual species accounts and in the separate article on this subject. Seedlings can be potted on into pots or plugs/plant modules as soon as they are large enough to handle. As with all seedlings take care not to damage the growing tip of the young shoot, or allow the roots to dry out. Perennial plants can be held for some time in their pots until conditions are suitable for planting. Annuals and faster growing biennials and perennials are best planted out as soon as they are big enough as their development may be compromised if they become pot-bound. Tap-rooted species (eg carrot family) need to be grown in taller containers and/or planted out whilst young. Wild flowers and grasses can be planted in to beds (eg as part of a herbaceous planting scheme in a garden), into newly sown wild flower and grass areas (before or after sowing), or into existing grassland or other vegetation. Plants can be planted in open ground at any time of year when the soil is workable. Plants set out in dry weather will need watering until they are well established. When planting into existing vegetation it is important to ensure that the young plant will find the space and resources it will need to compete against its new already established neighbours. Planting into existing vegetation is usually more successful in autumn as there is plenty of moisture available and growth of competing plants will be slowing up as winter approaches. Before planting you will need to create space in to which each plant can grow. This can be created immediately before planting by removing or inverting a patch of turf to expose a patch of soil. Alternatively gaps (c 30cm across) can be prepared in advance by killing patches of vegetation with a herbicide (eg glyphosate), or by leaving tiles or slabs over the positions in the weeks before planting. 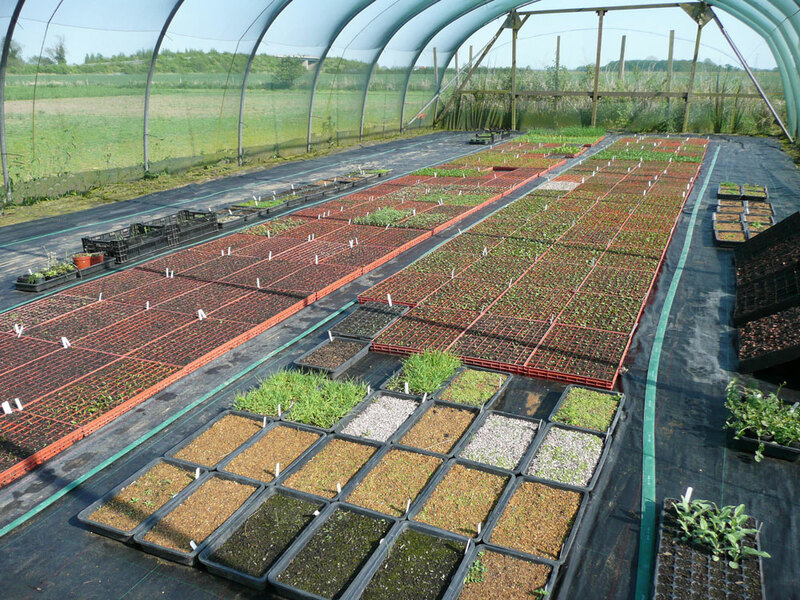 Whilst plants that have been raised in pots initially have a head start over seedlings sown directly onto the site, longterm success will still depend upon the suitability of the species to the environment in which each plant is placed. Good aftercare and management of the site will also be important.